Fire damage is one of the most insidious forms of damage a home can undergo during its lifetime. While the physical burn marks of a fire can be easily seen, smoke damage is pervasive and can pose very serious consequences to your health. According to FEMA and the U.S. Fire Administration, there are an estimated 372,000 residential fires annually in the United States. These fires result in an estimated $7 billion cost to property annually, and this cost appears to be rising per year. When it comes to recovering from the tragedy of a fire, professional and quick services are essential to potentially restoring some, if not all, of your personal property. When a house is ravaged by fire, the building materials and material inside the house may be burned, and if that is the case, several known carcinogens are likely to burn. This increases the danger of contracting cancer from being in close contact with smoke damage. Additionally, it can be difficult to fully assess the extent of smoke damage, and while the damage may seem minimal, smoke can easy permeate the ventilation system of homes, moving between the floors, walls, and into the piping. Since smoke alarms are not present in roughly 22% of residential buildings that have experienced a fire, it is safe to assume that the damage is usually far more extensive than initially assumed. Because smoke can infiltrate porous surfaces, it often becomes embedded into furniture, walls, wood surfaces, and carpeting. While it can occasionally be possible to wipe away the physical signs of smoke damage, the smell will remain and harmful chemicals will still be released into the atmosphere unseen. To help prevent this from occurring, you need the services of a professional fire restoration company to help your home after a fire. Fire Damage Restoration is a comprehensive process that involves an investigation of damaged areas to your residence in order to determine the extent of fire damage. Once that has been assessed, a Fire Damage Restoration company will begin a methodological approach of combing your home to clean up all evidence of smoke and fire damage. From investigating the ventilation system to unsurpassed cleaning of wood surfaces, furniture, and even the walls, your home will receive a thorough cleaning that removes the smells and the dangers of smoke damage. Once the process is complete (times can vary greatly), your home will be safe to enter, and oftentimes, many of your personal belongings will still be salvable. Call for assistance: Calling for assistance from a professional Fire Restoration company is the essential first step. With years of experience spent dealing with these exact kinds of situations, we can help start getting your house back to its original condition. Remove vulnerable people from the area: Children, the elderly, and pets are especially susceptible to smoke damage and its effects. They should be moved to a safe location away from the damage. Allow for additional ventilation: Because the ventilation system may be compromised, opening windows is the best way to allow for adequate airflow in the building until it can be restored. Take photos/inventory of the interior: Insurance companies will need a record of what was inside the building, and it is easier to do this before the complete restoration process has begun. Empty your fridge: Even if you don’t want anything from inside the fridge, emptying it out and allowing the door to remain open will benefit you in the future by preventing the build up of unwanted odors resulting from old food. Aside from what is listed above, please do not attempt to do anything else to your smoke damaged home. Doing so is dangerous and can release harmful chemicals into the air. 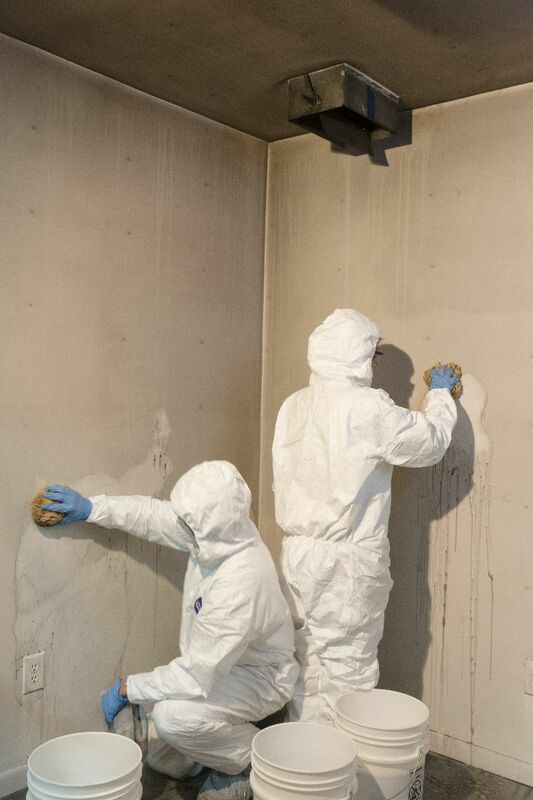 The best thing you can do now is wait for your professional restoration company to come and help restore your home. When your home is damaged by fire, you need immediate restoration to begin once you have been given the all clear from the fire department. By calling our company, you are hiring a preferred provider of fire restoration services. With a talented team of experts, we are able to address your needs and concerns as we work to clean your home. We know that fire damage can seem daunting, but with our team on your side, you can get a restored home that is once again a safe and cherished environment for you and your family. Restoration is the key to rebuilding. Keep Rainbow International’s number with your other emergency contacts, then call in the professionals to start restoring your home after a fire or schedule an appointment online.